R.T.M.R project correspond to a software to test. 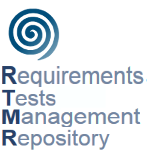 Each version of the software is linked to a version of a R.T.M.R project. These versions are often associated with deliveries occurring between contractor and project owner.